1. Heat oven to 425°. Melt butter in rectangular pan, 13x9x2 inches, in oven. 2. Mix flour, paprika, salt and pepper. Coat chicken with flour mixture. Place chicken, skin side down, in pan. 3. Bake uncovered 30 minutes. Turn chicken; bake about 30 minutes longer or until juice is no longer pink when centers of thickest pieces are cut. Lighter Oven-Fried Chicken: For 11 grams of fat and 235 calories per serving, remove skin from chicken before cooking. Do not melt butter in pan; spray pan with cooking spray. Decrease butter to 2 tablespoons; drizzle over chicken after turning in step 3. Chicken Fingers: Substitute 1 1/2 pounds boneless, skinless chicken breast halves, cut crosswise into 1 1/2-inch strips, for the broiler-fryer. Decrease butter to 2 tablespoons. After coating chicken with flour mixture in step 2, toss with melted butter in pan. Bake uncovered 15 minutes. Turn strips; bake 10 to 15 minutes longer or until no longer pink in center. 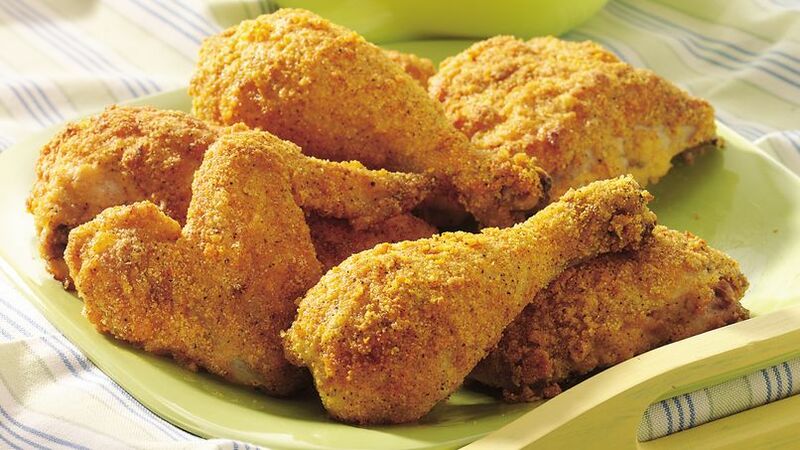 Crunchy Oven-Fried Chicken: Substitute 1 cup cornflake crumbs for the 1/2 cup flour. Dip chicken into 1/4 cup butter or stick margarine, melted, before coating with crumb mixture.